Turn on the news channel, tune into local public radio, or pick up the newspaper and almost every day, you'll find stories about immigration—positive or negative. The most recent local news that made headlines was a Grover Beach mother of three who was deported, leaving her children to pick up the pieces. 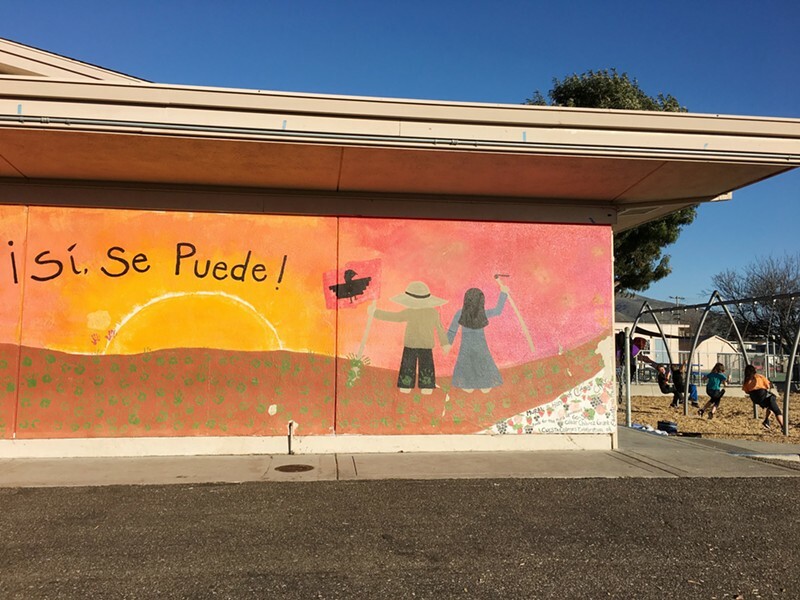 STANDING TOGETHER The current discussion surrounding immigration locally and throughout the United States is affecting young students, but the administration at Pacheco Elementary School wants to put its students at ease. Rick Mayfield, the principal of Pacheco Elementary School in SLO, sees his students affected by the current environment surrounding immigration. "Anything that bothers children and inhibits them from coming to school, being happy, open to learning, and being able to focus on learning. In that regard, it bothers me," Mayfield said. It hurts the entire surrounding community—the students and their families. When something hinders a student from learning, he said the district comes together to connect that student or their family with services. "Our mission is to educate students, of course, but there are a lot of things that affect that," he said. "So, as a district, if students are lacking in food, we have connections to the food bank and we connect them to those services." Right now, Mayfield is seeing the immigration discussion impacting the families of his students in a big way—ultimately impacting the students. Mayfield said it's important that his community has accurate information about immigration as well as an individual's rights. Therefore, the elementary school and the San Luis Coastal Unified School District and District English Learner Advisory Committee are hosting a public meeting called Immigration, the Law, and Your Rights on Feb. 22. "Our goal has always been for families to feel safe sending their children to school, and we have always prioritized clean and open communication," he said. The meeting is meant to give parents and guardians more knowledge about the current situation regarding immigration law and deportation enforcement. Speakers for the meeting include: local U.S. Rep. Salud Carbajal (D-Santa Barbara), San Luis Obispo Police Department Chief Deanna Cantrell, Javier Cerritos of the Mexican Consulate, immigration attorney Amber Heffner, and Dawn Addis, founder of the Women's March SLO. The meeting will cover updates on federal law and practice regarding immigration enforcement, local law enforcement interaction with federal immigration since the Sanctuary State Bill passed, what families can do, how to look for an attorney, and accurate information on school district interaction with Immigration and Customs Enforcement (ICE). "Attendees should expect a message of support. You know we are here as a community to support every member that is here, regardless of their immigration status. It's not for us to check," he said. An incident that worried many of families and students in Mayfield's school involved three undocumented immigrants who were detained in San Luis Obispo on Jan. 24. "Inaccurate words spread quickly that there were road stops set up for people and they were doing sweeps, even going to schools," he said. "We quickly verified that it was not correct; it was three isolated arrests that were made." After getting the correct information out there, he realized that it's imperative for the community to have accurate information and know their rights. "A lot of times people hear things and the word spreads but it's not accurate information. We always want to make sure our families always have accurate information," Mayfield said. The meeting will be held at Pacheco Elementary School in San Luis Obispo, in the multipurpose room from 6 to 8 p.m. For more information visit pa.slcusd.org or call (805) 596-4081. • The Port San Luis Harbor District is now hiring seasonal lifeguards. Applications are due March 5 at 4:40 p.m. The seasonal position runs from April 13 through Oct. 28. with lifeguards on duty full-time from June 1 through Sept. 3. For more information, visit portsanluis.com.